Need help, thoughts on MOC character? Home › Forums › Member Spotlight › Need help, thoughts on MOC character? This topic contains 2 replies, has 2 voices, and was last updated by V-Tundra 2 years, 1 month ago. 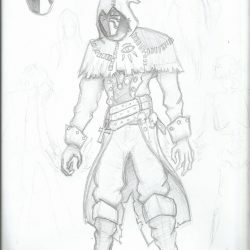 So I’ve recently joined a drawing competition that involves creating and designing a superhero/supervillain. I have my design finished (though not finalized) and I’ve drafted his backstory, but since it’s still pretty fresh from the oven; I would like some feedback on both the character’s design and how well written his backstory is. So without further ado, I present to you “Ouija”. As always, feedback is always appreciated and gratified. Just a heads up, my first draft is a bit crappy since my human figures always have the proportions wrong; hopefully I’ve still got the time to get the proportions better by the time the contest arrives. Superpowers: Revival and control of the dead, both in zombie and ghost forms. Backstory: Andriy Sirko was born in a rural farm near Kherson, Ukraine as a medium. Since birth, Sirko was able to communicate with the spirits that haunted the farm. He would listen the dead talk about their lives, their experiences in the afterlife and their laments and sorrows of being stuck in the mortal realm. As he grew speaking to the deceased, Sirko developed an unhealthy obsession with death. The tales of the afterlife he had listened through his childhood had gripped him to the point where he had to understand how death worked, and how the living passed on. Day after day, the subject of death and the afterlife digged deeper and deeper into his mind. One day, when his poisoned curiosity got the best of him, he killed his family and studied how their souls passed from the mortal realm to the realm of the deceased. Unsatisfied with his experiment, he escaped the farm he was raised in and searched fpr cults and groups of the occult to further his studies into his obsession. After being received by an obscure occultist sect in Kiev, Sirko began studying into the arts of necromancy. His abilities as a medium allowed him to further develop his powers and to stand out from other students. In 10 years time, Sirko had the powers to resurrect and control the dead; whether it be in spectral or zombified forms. To complete his studies and complete his training, Sirko needed to find “The Bone Volumes”; a cryptic collection of tomes that contain the most powerful spells and curses a necromancer could master, and according to legends, “The Bone Volumes” contain the key to immortality. “The Bone Volumes” were so powerful, that even the sect Sirko belonged to denied him access to the books. Even if they knew where the books were, they wouldn’t allow anyone to master such damaging and unsustainable power. Blinded by pride and his growing obsession, Sirko escaped the cult and resorted to crime to find the legendary books. Under the name “Ouija”, Sirko uses his powers to scare, torture, kidnap, blackmail, abuse and kill anyone who stands in his way. He co-founded “The Arch”, a metahuman crime syndicate to further his own personal goals and boost his reputation as a villain. Sirko’s ultimate purpose is to become master of death. If he were to die, he would encounter all the souls of every single man, woman and child he used in his crimes; not to mention his victims, and all would torture him for eternity in the afterlife. Sirko became too attached to death that he would eventually fear it. He intends to master and control death through his life and crime sprees, desperate to find “The Bone Volumes” and achieve immortality. In order to master it, Sirko needs to also understand it. On occasions, he will kill innocents simply to observe their passing from living to dead and try to understand how death works, how his powers work and how to amplify them. Extra tid-bits: In order to amplify his powers, Ouija carries with himself small trinkets that have certain significance in necromancy: Small skulls used in voodoo rituals, an Ankh retrieved from a cursed tomb, pocket-watches that mark the time of death of their original owners, etc. After giving it some thought I would say the backstory is pretty good. The character’s reasoning for his decisions are reasonable (from a storytelling stand point that is, obviously these are not the actions of someone who is sane), his becoming a villain and rise to power is rather interesting. And I like how you give him a vulnerability, a fear of death, as it makes the character all the more interesting. 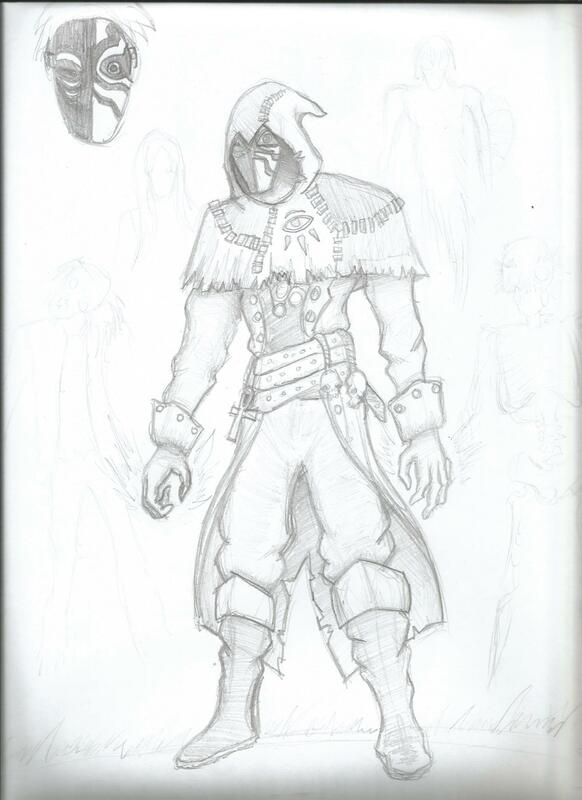 As for the design, the mix of a scarecrow inspired look with occult symbolism is pretty interesting. To help with the proportions I would say make the arms a little shorter. Thanks for the feedback, Shen. I’ve decided to leave his background story as it is, but if I see room for improvement, I’ll add a variation of the story here. And the same goes for the design, I’ve recently acquired a wooden posing doll which should help me with drawing better proportions. Any new sketches will be uploaded here if anyone’s interested.